The search for a great cracker has ended with an entry from Texas. Organic and artisan-baked, these crackers are better than anything I have tried in a LONG time. Doctor Kracker combines healthy ingredients with very little salt and sugar to produce a truly original product. They call themselves the "experts in UBER crunch" and I agree with them. These crackers are incredibly crunchy. I have them next to my potato chips in my kitchen cabinet. Guess which one I have been reaching for? The photo above shows that they incorporate many different kinds of seeds. 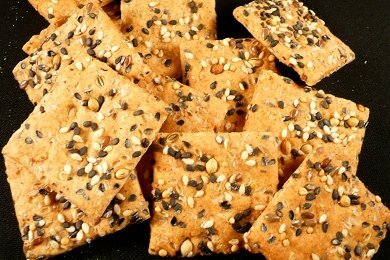 Sesame, sunflower, and pumpkin seeds all add nutrition and taste to the cracker. They are not a buttery cracker like Ritz Crackers. They are a substantial cracker like Kashi Crackers. Most of their crackers are 100% whole grain. I was a bit disappointed to see that the more "gourmet" ones in their line-up had less whole grains per serving than others. BUT, they taste great and are so much better for you than Ritz Crackers. I found a list here: Whole Grains Council that compared crackers across brands and within brands. Kashi Crackers does okay with 8 grams per serving. But some of the Doctor Kracker such as the Seedlander Snackers have 19 grams per serving (over twice as much!) and they taste better! Of course, all that artisanal, organic, whole grain taste is going to cost you. At $5 for a box (on average), you are paying for all that love they put in them. The link below from Amazon is a bargain for 5 packages at $23 - but that is alot of crackers! Healthy crackers are a good snack, but not as good as Apples, Bananas, or Oranges. The high price of these crackers will keep you from eating them too quickly. Savoring your food is important, and I try not to worry about the price if it tastes good and is good for me. My kids really loved the Apple Crisps (8 grams of whole grains). These are an excellent substitute for goldfish or cheddar bunnies which have a LITTLE bit of whole grain. Doctor Kracker is on Amazon and at Whole Foods. There is a list by state on their website here Doctor Kracker. You can also print out a 75 cents off coupon from their website to entice you to give them a try. Have any of you tried Doctor Kracker? Please share. These crackers look very similar to the multigrain chips from Food Should Taste Good, which are AMAZING. They're packed with fiber from flaxseed and protein from the other seeds and rice in the mix. Definitely check it out! I like those ingredient lists! I haven't tried Dr. Kracker but it's nice when crackers contain a variety of different flours and seeds; we get a really good variety of nutrients that way! Thanks I have heard about these and am so happy to see that my grocery store carries them! Saw these on here, but honestly had never heard of them before. Just so happened I was at the local co-op picking up a few things I get there I can't get other places, and I saw them. They only carried like 4 of the flavors and it was just the flat breads, not the little crackers (too bad as I want to try the apple ones). Anyway, ended up getting the pumpkin cheddar ones. I had one on its own and my husband asked what in the heck I was eating. I jokingly asked him if he wanted a bite of my roofing tile (it did sort of resemble one and is very crunchy). I thought it wasn't bad. Today, made some hummus and had one with it slathered on- really good. Husband had one, and then went and had another! So, there is our verdict... Pretty yummy. Forgot to mention- paid $4.79 for them. For the flavor I tried, each flatbread/ginormous cracker is 100 calories and has 13 grams of whole grain (one of the other flavors was 120 calories, but don't remember which one it was). They are about the size of an extra large poptart for lack of a better way to describe the size. They are very filling.